The OC-82 is designed to withstand hard use in any environment. Kata's TST technology on the front of the bag and the honeycomb reinforced circumference provide ultimate protection for the gear within. 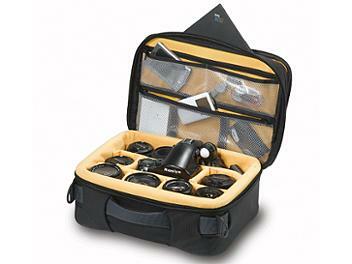 The first deep compartment is for the photographic equipment, it can be customized to fit 1-2 D/SLR bodies with 3-4 lenses & accessories, or a Medium Format Kit. If additional division is necessary a Modi-Vers Kit is included. The second shallow compartment is designed to hold laptop or paperwork. A large external padded pocket for personal effects and an internal accessory pocket panel will allow for additional storage solutions. 2 straps are available to connect a small tripod to the exterior of the case. The OC-82 features a strong padded carrying handles, a BSS shoulder strap and an Insertrolley connection sleeve (Insertrolley not included).